FW Guerin - Guernsey "'Grand' Querrue"
CAN YOU HELP WITH PHOTO IDENTIFICATION? It is understood that this photographer was active in Alderney from 1900 to 1918. 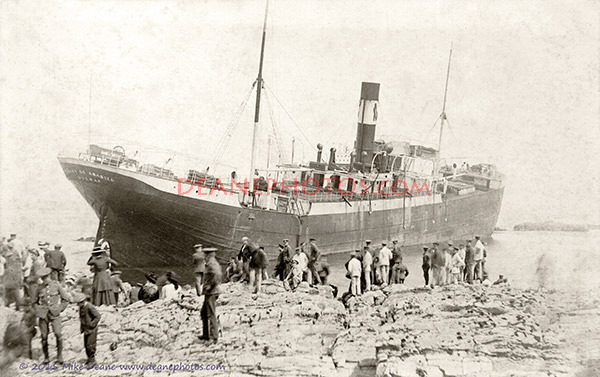 On 7th June 1910 a Spanish Steamer of 4,500 tons named 'FELIX DE ABASOLO' stranded on Les Boufresses reef in thick fog. The Bilbao steamer was carrying coal and general cargo from Newcastle in England to the Italian port of Genoa. Soldiers from Fort Albert on Alderney rescued the crew, landing them on Raz Island (a sea fort off Alderney). They were later taken to Alderney. The ship became a total loss. Photographer: At the present time, though unmarked, this image is being attributed to Le Cocq as it is similar to other known photos.